We tried this Middle of Lidl electric lawn mower which goes on sale on 18 April. Read on to find out whether it's worth buying. If your lawn isn’t big and you don’t want to spend much time and money on keeping the grass trimmed, then you might be wondering if this inexpensive mower from Lidl could be just what you’re after. The Parkside Electric Lawnmower promises to keep your lawn neat and tidy and comes with a three-year warranty. There are few mowers that are that cheap to buy so is it the perfect solution? The Which? Gardening magazine team have tried it out to see how well it cuts the grass and gets up close to the edges of the lawn so we can give you our verdict. What does the Parkside Electric Lawnmower have to offer? 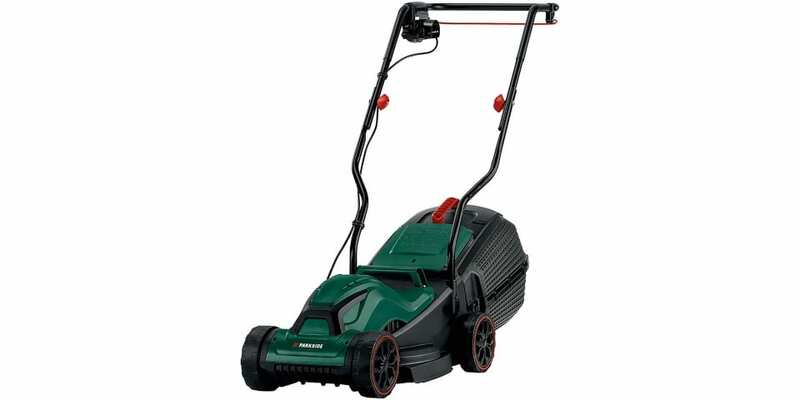 This electric mower is powered by a 1,200W motor and has a 10m power cable. You may need to use an extension lead if the cable won’t reach to the end of your lawn. Be sure to use a residual current device (RCD) to keep yourself safe if the cable should get cut by accident. The mower has a cutting width of 32cm which is perfect for a small lawn that’s less than 50 sq m. This smaller cutting width also makes it easy to mow around obstacles such as washing lines and garden furniture. To reduce the need to tidy up with a grass trimmer after mowing, the mower promises to be able to get close to lawn edges. For easy use, it also promises to have smooth-rolling wheels and a height-adjustable handle. The 30L grass-collection box has a fill-level indicator so you’ll know when the clippings are ready to be emptied. Finally, the cutting height can be adjusted to three heights so you can leave the grass longer at the start of the season and reduce its height in the summer to avoid stressing the turf. Read our full first look to find out what the Which? Gardening magazine experts thought of it. An electric mower with a cutting width of 34cm or less is perfect for a small lawn under 50 sq m. To keep your lawn looking decent, it’s much better to cut it once a week rather than leaving it for the grass to grow, as small lawn mowers often struggle to cut long grass and leave poor results. You’ll also find it takes much less time to cut grass while it’s short and the mower will find it easier to pick up the clippings so you don’t have to rake up afterwards. Move any objects off the lawn, such as kids’ football goals and washing lines, as mowers can struggle to get up close to them and leave tufty grass that needs to be trimmed afterwards. Keep the grass looking green by feeding it with a lawn food. If you have weeds or moss and they bother you, look for a lawn food which contains treatments for these. Remember that many lawn weeds are quite pretty, such as daisies and clover, and pollinators often feed on the flowers. Feeding once a season is ok, but for the best results feed it four times from spring to autumn.